December 21, 2000 - Cartoon & Christie LTTE. March 14, 2003 - Living Rivers and Grand County Citizens for Clean Water launch a campaign to protect the water supplies of Moab and Spanish Valley from innappropriate development. See full-page ad from the Times-Independent. 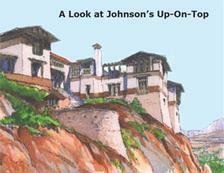 May 8, 2003 - Lawsuit launched against Grand County over illegal action on SITLA properties at Johnson's-Up-On-Top for a development called "Cloudrock." August 2006 - Cloudrock brainstorming sessions to be held in Moab this week. February 15, 2007 - Grand County Citizens for Clean Water place a full-page ad in the Times-Independent. November 29, 2007 - Group appeals County PC decisions on Cloudrock. March 17, 2008 - Moab activists call builder a threat to area's water supply in the Salt Lake Tribune.